Agricultural development initiatives feature many public and private organizations working together across sectors and scales to pursue the goals of food security and climate resilience. Policy networks are considered a crucial ingredient for the learning and cooperation needed to effectively implement agricultural development projects and increase community resiliency, yet very little comparative empirical data has been collected to assess where and how these networks operate. We contribute to filling this gap by characterizing the governance and leadership patterns within agricultural development policy networks that connect organizations working on climate resilience and food security activities in 14 smallholder farming communities across 11 countries in East Africa, West Africa and South Asia. We integrate theories of network governance and leadership in international development settings with social network analysis methods to analyze network structures and understand the roles of various actors working collaboratively toward agricultural development goals. We present two critical findings that advance our theoretical understanding of network governance and have implications for agricultural development policy globally. First, we find evidence for three distinct network types: shared and brokered networks, as predicted by the network governance literature, as well as a class of fragmented networks that exhibit extremely low levels of coordination at their core. Additionally, we find that while the presence of international development organizations is associated with greater overall network coordination, it is local and regional organizations that fill central network leadership positions most frequently. These findings suggest that resources may be an important factor in overcoming the cost of coordination, but social capital among local actors may be more important for developing network leadership. Rudnick J, Niles M, Lubell M, Cramer L. 2019. 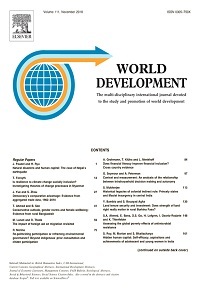 A comparative analysis of governance and leadership in agricultural development policy networks. World Development 117:112-126.